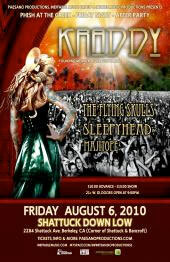 Builders is bringing the Savvy Traveler from LA to Bay to rock in Oakland! W/. support from live MPC team The Flying Skulls, the Builders residents, DJ HALO, and live art by Brendan Foster, we're keeping the summer vibe alive! Legionnaire is hype, get there early, could sell out! Going to be a huge night. Location is an Oakland warehouse TBA. The Flying Skulls will be headed to Tucson for an interview and performance on KXCI 91.3FM, an appearance on Saturday night at the festival grounds, and an afterparty rage fest at the Solar Culture Gallery Sunday morning. This year featuring Flying Skulls vs. Mochipet! 3 nights of live music, gems, minerals, and art coinciding with the Tucson gem show. Gem and Jam will have two full stages of music, live performance painting, a Bazaar featuring gem, jewelry and art vendors, performances, and much more. 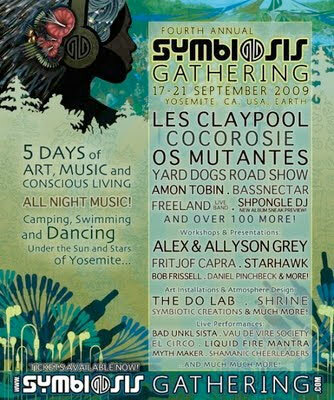 Our favorite festival!!! 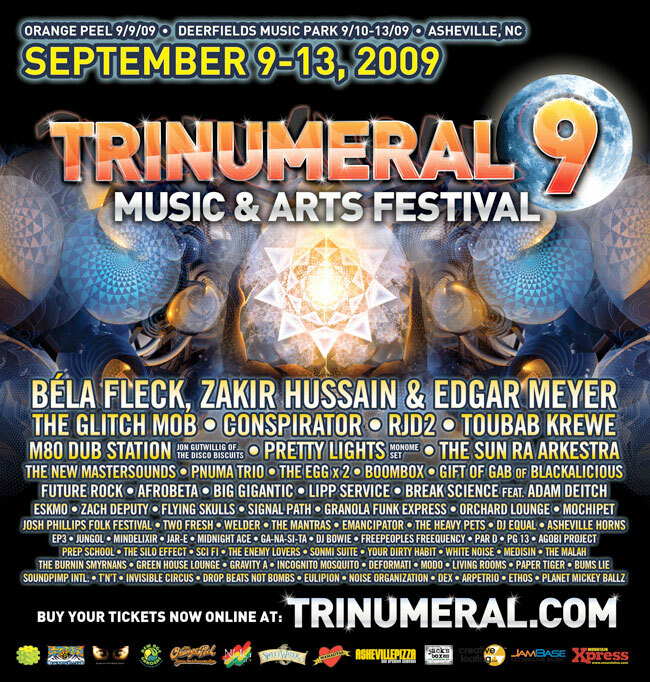 starring: Abstract Rude, Flying Skulls, Citizen Ten, Joe Mousepad, DJ Zole w/Speach Impediments (OC), B. Squid, Dawn Gun w/DJ JiJi Sweet, Mis Lee Ding, Namek. comes an expertly crafted collection of remixes from some of the best minds in electronic music. Includes remixes by Project Aspect, Mochipet, Edison, The Bins, Shygone, Professor Bang, Nonagon, and Alien Archetype. The Flying Skulls are a hard-hitting, West Coast production crew that plays trap, breaks, electro, and perform live on custom built MPCs. 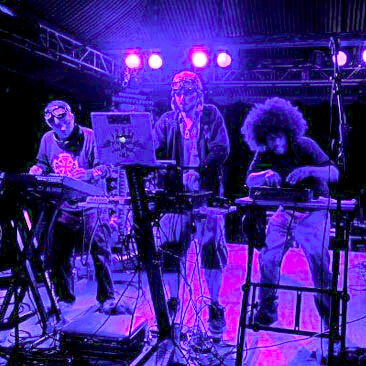 The Skulls have made a name for themselves by destroying festival dancefloors and leaving a trail of ecstatic music fans across the US. Since their inception in 2008, their own brand of slippery basslines, crunked out beats, and distorted synths has been captivating rooms and inducing spontaneous dance. 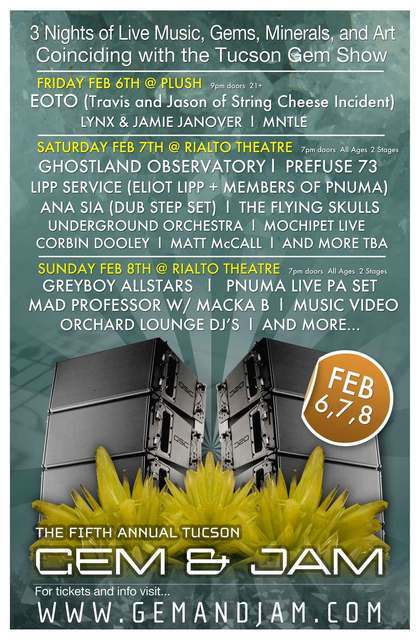 It's live West Coast Bass at it's best. 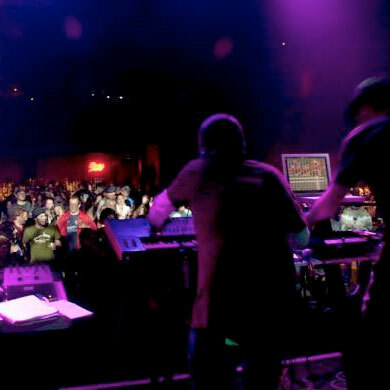 J.Tonal is a well known fixture of the Bay Area Electronic and Controllerist scenes. 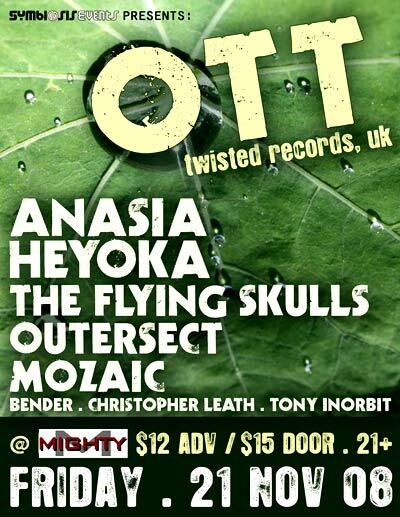 He is a Flying Skulls founder and producer/remixer/controllerist who bangs out live finger-drumming on twin MPC1000s. Esau is a melody addict and synth engineer known for crafting razor sharp bass lines and seen live playing keys on the MS2000, Mikro Korg, or hitting progressive melodies on the MPC1000. Life1 is a DJ and producer who has had his finger on the pulse of the Bay Area for the last decade and a half, Life1 is a student of street music, club music, and life music. Jerome Forney is a stuntman-turned-DJ, producer, and a dope rattler of bones from the hot and dry Middle-East of CA. In their element and in hostile territory, this release features ten Flying Skulls tracks recorded while on bass-curdling missions. 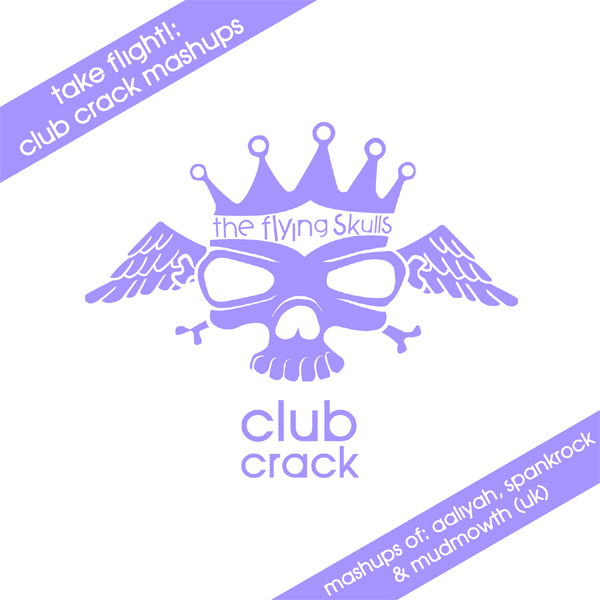 Mash-ups from the album Take Flight! Feat. Spankrock plus Mudmowth & Aaliyah. 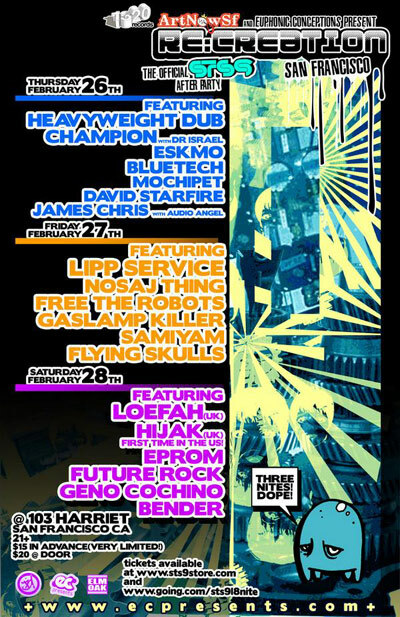 Two year anniversary party with The Slayers Club Jan28 @ Public Works SF. 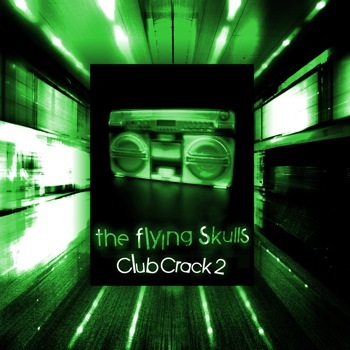 The Flying Skulls to have a song featured on an upcoming version of the iPhone's hit game Tap Tap Revenge. The game will use the Skulls and Angels Deconstruxion off of The Flying Skulls album Take Flight! By Feb of '09, Tap Tap Revenge was the number one App download from the iTunes store, and by April was on one out of every three iPhones (34%). 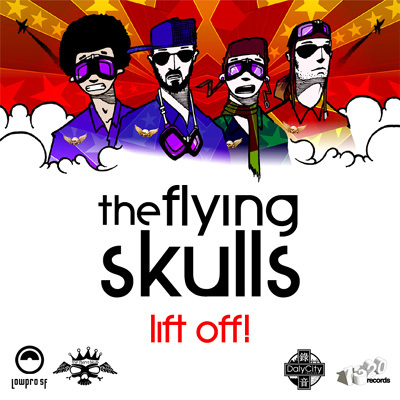 "[The Flying Skulls] produce some of the best deep bass party grime but somehow manage to stay sophisticated and hold the listener’s attention for more than 5 minutes. Raw, but never hard on the ears, each of the (producers) bring their own flavor, making the overall sound a tricked-out blend of crunk, dubstep and breaks." -Canary / Pirate Cat Radio 87.9fm. West Coast digital Hip-hop mutants The Flying Skulls have hit us up with a few rocks of their Club Crack remix bootlegs that are almost as disturbing as they are dope as f**k.
To be honest I'd be kinda scared to drop the Spank Rock sampling Club Killer remix out in an actual club, in case it did inspire literal dancefloor murderations, whilst Welsh rhymer Mudmowth is having a 'Circus In The Cemetery' and 'Carnival On Your Carcass' with his classic Skullcrackology track getting the full filth treatment from the The Flying Skulls. The death analogies don't stop there either as the ghost of Aaliyah haunts the live jam remix of Rock The Boat, probably what The Ferryman has cranked up loud on his MP3 player if he's still shipping souls to Hades. These tracks are essentially mash ups with the beats to be found on their forthcoming album Take Flight, which isn't actually all death and doom, although it is certainly a killer. We'll tell you more about that twisted beauty nearer the time, although if you download the zip files to retrieve all three tracks then there's a press release preview for your perusal. "Many an old skool Techno producer tried to install a Jazz ethos to the world of computer technology, Im not convinced any of them truly managed it although Im sure there are those who would gladly prove me wrong on this. 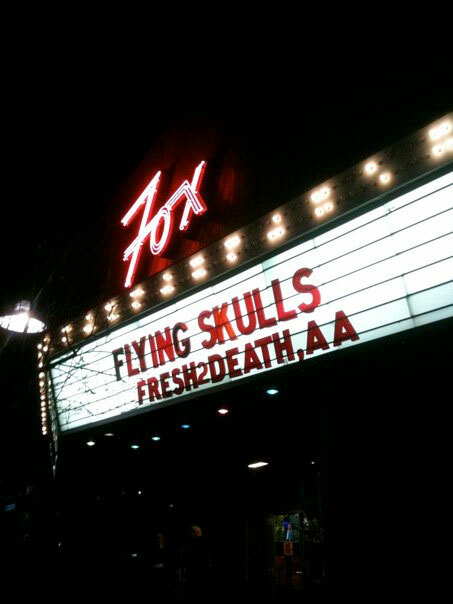 People have found it hard to equate the rigid world of technology with that freestyle spirit, but Flying Skulls certainly help to bridge that gap. For me they might well be the kings of improvisational beat bashing and the two live sets weve put up on the blog have been testament to that. It makes sense then that they should release an album of tracks gathered from their live performances. A heavyweight collection of nasty synths, wobbly basslines and crunked out glitchy beats so dirty you'd swear they robbed their MPC players off a crack dealer. J Tonal, Snareface and Jerome Forney are joined by Ribotto and rapper Zap Tap, this is Flying Skulls in their element, and whether or not you could class it as strictly a live album, this album is most definitely live. It is also free through the combination of Daly City and 1320 Records so you have no reason not to go grab it right now." 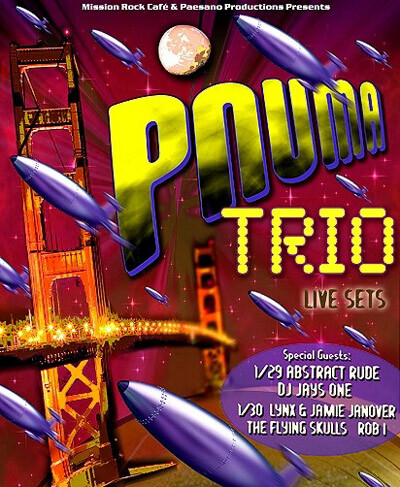 "We haven't yet finished jamming the last incredible live set they gave us (one of the most played mixes of last year) when the Flying Skulls do it once again with a set recorded at the Juxtapoz Magazine / ArtNowSF Party at VeniVidiVici in San Francisco earlier this month. 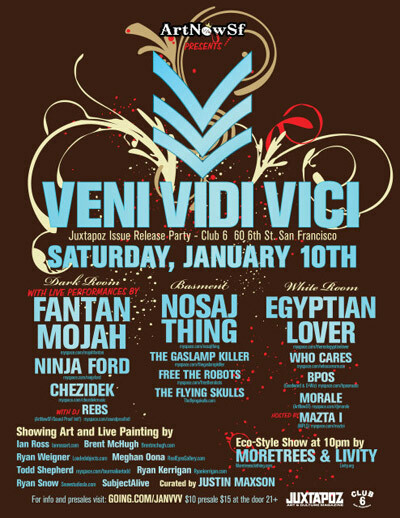 We're gutted we missed this one with a line up which included Fantan Mojah and Ninja Ford live, Nosaj Thing, Gaslamp Killer and Egyptian Lover amongst many others, and if this Mutant Electro Crunk set is any marker of the night's quality it was a damned good one." An expertly crafted collection of remixes from some of the best minds in electronic music. Includes remixes by Project Aspect, Mochipet, Edison, The Bins, Shygone, Professor Bang, Nonagon, and Alien Archetype. The Skulls' second studio album, featuring collaborations with Lotus, Mudmowth and Audio Angel, Smokovich, Astroid Boys, and Nonagon. Mashups from West Coast Bass featuring Drake, T.I. Kanye West, Lil Wayne, Easy E.
The release features a bassy mid-tempo title track, fused with funky synth lines and a driving groove, plus two remixes of The Dope Trade. A remix album in volumes featuring the vanguard of West Coast electronic music producers. Remixes by Mochipet, Preshish Moments, Ribotto, and Vladimir Computin. A remix album in volumes featuring the vanguard of West Coast electronic music producers. Remixes from Cyril Noir, Jason Short & J.Rogers, Ribotto, Bender. Spankrock plus MudMowth & Aaliyah. Banging drums, dirty grimy low-end, mucked up distorted synthesizers, dope West Coast vocalists, and dancefloor-rending beats with a cinematic depth meant for the very largest of soundsystems. Rock It Science Records. Mike Genius gets remixed. With remixes by The Flying Skulls, Robot Koch, Frietboer. With remixes by The Flying Skulls, Pretty Lights, Lazersword, Eskmo, The Glitch Mob, Ott. With remixes by The Flying Skulls, Jason Short, J. Rogers. With tracks by The Flying Skulls, Mochipet, Samples, Nasty Nasty. Where did the Skulls get those BANGIN MPCs? 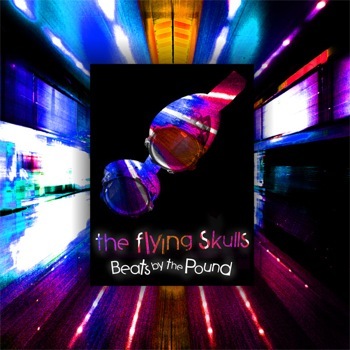 The Flying Skulls work with an MPC designer called 16squarez.com that creates custom MPCs for musicians. Contact 16squarez.com for custom MPC2500s, MPC1000s, MPC4000s & MPC 5000s. They now do screen printing on MPC bodies as well. 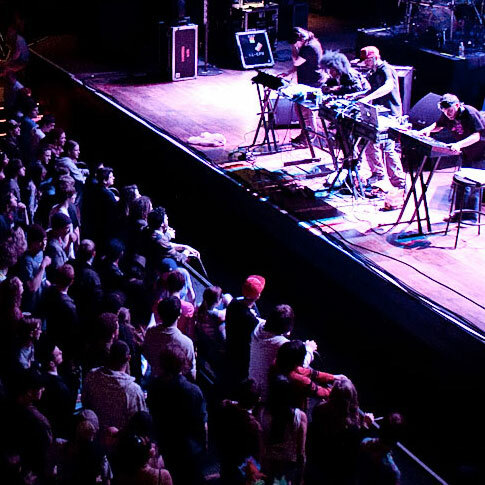 1320 Records is an independent record label started by the members of STS9 as a place to release nu school and left field music. The Skulls released their first album Take Flight! on 1320 in 2008 and have released 5 additional projects since then. Visit 1320records.com for cutting edge music from artists like Alex B, Emancipator, Eskmo, Mochipet, Prefuse 73, Telepath, Two Fresh, and more. Daly City Records is a boutique record label started by Mochipet, based in San Francisco. The Skulls released an early album, Abducted! 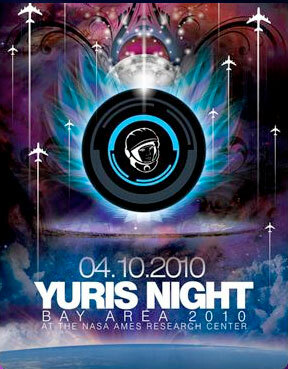 Vol 2 on the label and have played many shows with artists on the roster. 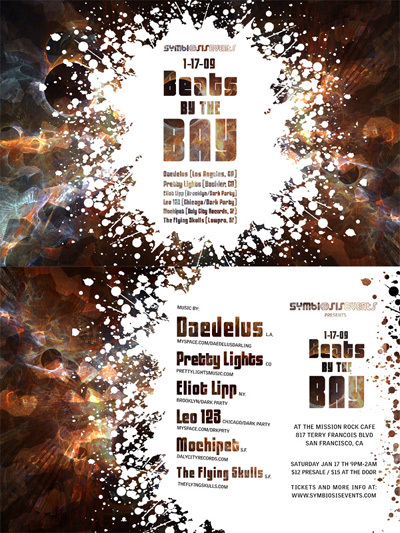 Visit dalycityrecords.com for nu school electronic music featuring artists like Ben Samples, Daedelus, Deceptikon, edIT, Sugarpill and more. 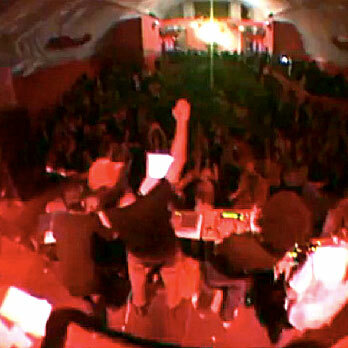 The Flying Skulls have enjoyed a great relationship with Korg since the band was first founded. 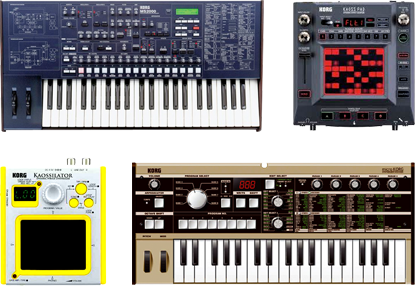 The Skulls live show includes a Korg MS2000, a Mikro Korg, a Kaos Pad 3, and a Kaosillator. The Flying Skulls have been in the studio crafting a new live setup which has at it's heart, a shift to live MPC performance. With the help of 16squarez.com, the Skulls have been outfitted with custom MPCs and have been steeping and fermenting their sound into mashfest of finger-drumming and floor-moving bass. 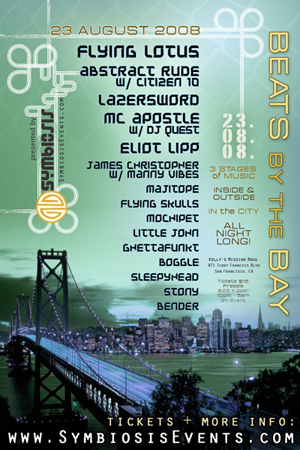 It's live West Coast Bass at it's best.